My name is Carl-David Granbäck and I am a 28 year old guy from Sweden. In 2009, I embarked on a great journey and cycled across South America, from Tierra del Fuego in Argentina all the way up to the Caribbean Coast of Colombia. You can read more about it on my previous blog. Ever since I came back from that trip, I’ve felt a strong desire to get back in the saddle and head out into the unknown. 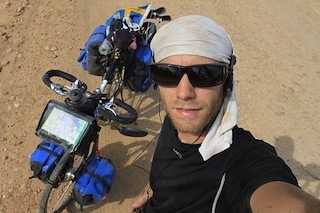 So this time I have decided to cycle from Sweden to Africa! With this blog, I want to share my experiences from the road with the rest of the world, and hopefully make you feel inspired! I am currently working as a front-end developer at Capgemini, but will start cycling the 23rd of June. Apart from travelling, cycling and spending time in nature (or preferably doing it all at the same time), I enjoy rock climbing, web development and self-sufficiency stuff. If you have any questions, thoughts, contacts or anything, please send me an e-mail!